Maybe it’s just me, but it feels like everyone wants to go to next month’s über important World Cup qualifier between the US and Mexico at Columbus Crew Stadium. Of course that should probably be expected given the team’s recent Gold Cup triumph, their 11-match winning and the fact that the Yanks will be facing their most hated rivals. admit it: you know you do. The only problem: Crew Stadium currently seats around 24,000 fans. Which means everyone won’t get to go. And as of yesterday, the game was officially announced as sold out. Even for those who did secure tickets, the process for doing so was about as easy as licking one’s own elbow (Go on… try it). From a myriad of overlapping pre-sale opportunities — AO, US Soccer Supporters Club, and ultimately Crew season ticket holders — a lottery being instituted for the general ticket sale, and delays to all of the ticket awarding announcements, it’s been extremely frustrating. Thankfully, I was lucky enough to be one of the few to land tickets in the initial American Outlaws sale, meaning I’ll be heading to my second US-Mexico clash in Columbus. Though if I hadn’t, you can be damn sure I would have ended up paying through the nose on StubHub just to make sure of my attendance. Unfortunately, that’s not an option for everyone and I know that means many fans will still be left out in the cold for US Soccer’s biggest game of the year. But fear not American soccer fans… Wrong Side of the Pond has your back. Well, let me rephrase that: I’ve got two of your backs. 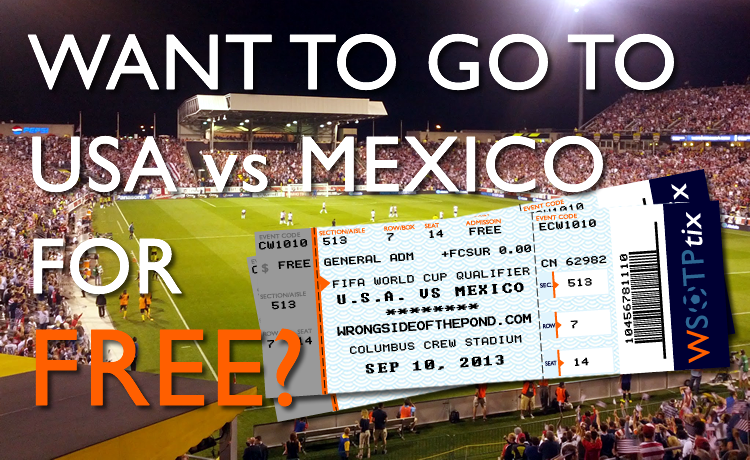 Anticipating the crazy demand, I made sure to get my hands on a pair extra tickets for the USAvMEX match on 9/10/13 at Crew Stadium… and I’ll be giving them away for FREE to one lucky WSOTP follower! If you don’t already, follow @wrongsideofthepond on Twitter. Then, shoot me a tweet with the hashtag #WSOTPtix4U. Current followers, all you have to do is send me the tweet. If you don’t already, like the Wrong Side of the Pond Facebook page. Then share this exact post right here → https://www.facebook.com/wrongsideofpond/posts/10153101967470089with your friends. If you like the page already, all you need to do is reshare the post on your wall. If somehow you lack a social media account, you can drop me an email at wrongsideofthepond [at] gmail [dot] com with the subject WSOTPtix4U. Each contestant can enter the competition a total of two times using any of the methods mentioned above just once. The deadline for entries will be Friday, August 9th, at 11:59pm Eastern Time. The winner of the pair of tickets will be selected from the entrants in and announced in a post on this site on Saturday, August 10th at 8:00pm Eastern Time… exactly one month to the minute from kickoff in Columbus. The winner will have until August 13th at 8:00pm to confirm they will be able to attend the match. If at that point it is determined they can not attend, or no response has been received, a new winner will be selected from the remaining entrants. The winner can pick up their pair of tickets either in person at the pre-match festivities OR at will call. If you’re thinking about entering, or already have your tickets, be sure to checkout my guide to visiting Columbus Crew Stadium for hints and suggestions on parking, lodging and the like. Also, keep an eye out for me both prior to kickoff and at the game. Final plans for the pre-match festivities — which is likely to include a WSOTP Shop shirt giveaway — are still in the works, but you can watch this space as I’ll be sure to provide updates. So if you missed out on lottery tickets, or just didn’t feel like dropping some coin to buy them in the first place… it’s about time you get on with registering, right? !